Toby Jugs – Will the real Toby Philpot please stand up? Although man has been fashioning vessels in his own image since he first discovered how to make waterproof containers out of clay, the Toby Jug is a particularly British phenomenon. Many stories abound over who was the original ‘Toby’ on whom the jugs are based. And although a couple of heavy Stingo drinking Yorkshiremen are attributed with being the original Toby Philpot (fill pot), there’s no real proof that a single individual is the true inspiration. But, hey let’s not mess with legend! 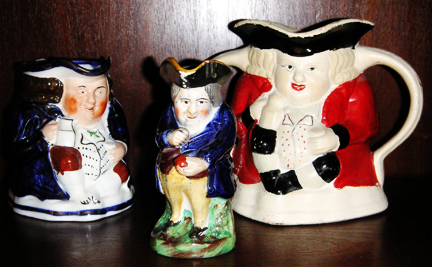 Toby Jugs were originally large pitchers for serving ale in English hosteleries and inns during the 18th century. Over time their practical use diminished (they posed hygene issues with all the little nooks and crannies which were difficult to clean) and they were made for purely decorative purposes. 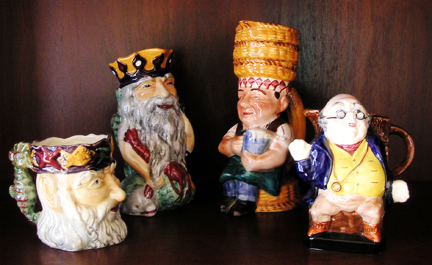 The ‘original’ Toby design is of a portly gentleman sitting on a chair with a brimming mug of ale in one hand and a long stemed pipe in the other. Many variations of this design have been made by many different potters over the years but it remains the standard design and is known to collectors as the ‘Ordinary’. Other styles of Tobies depict our portly gentleman seated on the ground with one knee drawn up or in a standing position, usually taking a pinch of snuff, playing the fiddle, and many other different poses. My collecting interest lies with Toby Jugs of the 19th to mid 20th Century. I have about 25 so far but I do NOT collect character or face jugs such as the Doulton series ware which just model the head and shoulders of their subject. Don’t get me wrong I have nothing against these jugs, but I have kept my scope on Toby Jugs and am avoiding the ‘made for collectors’ items if possible. The three Tobies I have selected from my collection for this photo are my three oldest ones. The Squatting Toby with the blue lustre coat on the left is from Allerton’s Pottery in Staffordshire and is probably from the first half of the 20th century. In the centre is a Snuff Taker made by Sampson Smith dating back to the late 19th C. and the red coated one on the right is my favourite: a double handled, double sided squat Toby from the 19th C.
As a sub-set of my Toby collection I have a collection of Toby Jugs made by Shorter & Son from the mid 20th Century. The style of these jugs is very different to that of other Tobies; kind of quirky. And that’s probably why they appeal to me. The hand painting is often naive but I prefer that to the airbrushed perfection of the Doulton, Artone and Kevin Francis type of models. 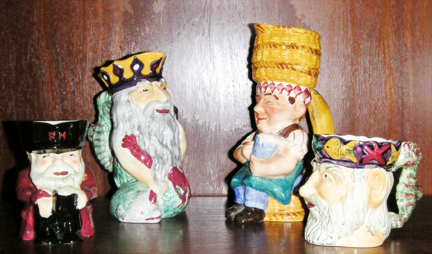 My one exception to my ‘no character/face jugs’ rule is a Shorter & Son King Neptune character jug which complements the King Neptune Toby (both 1950s-1970). King Neptune is a great model of a merman with a lobster across his front and a sea horse as the handle. The other example I have selected here is Covent Garden Bill (1940-1950), sitting on a fruit basket with another on his head and a banana for a handle. He is a reasonably uncommon model so I was particularly pleased when I managed to add him to my collection. He also has a character jug version which I will definitely make another exception for and add to my collection if I come across. And the last example I’ve chosen is the Chelsea Pensioner on the left (1930s-1964) which, at 4.5″ is the smallest of three sizes in which this model was made. 30 Responses to Toby Jugs – Will the real Toby Philpot please stand up? This is really neat! Thanks for sharing this information! I have a 1940’s toby table lighter made in england. I have not been able to find out its value. Can anyone help me? Great fun reading about other Toby Collectors. Shorter is interesting, I need more info. about year of making.I have a few Shorters, the Hollins Ordinary, a Standing Toby and a Beefeather Character, black hat. what a absolutely fantastic site to “stumble onto”acidentally.i was left 4 toby’s by mom-in-law when she passed and the word has whispered out.i have ooh 20-25,i’m afraid to count[grin]some royal doulton,some woods & sons,some unmarked.2 [smalls]halloween type bandits.its always fun to see what i see and what others [gift]me with.life is too short not to smile and these toby’s sure make me smile! There is a certain charm about Tobies that’s hard to resist, isn’t there Sherry? And I fully understand how you can become addicted before you know it. Although I have Tobies from a number of different manufacturers, most of my collection has headed in the Shorter and Son direction. There is something about the unsophisticated ugliness of them that I am drawn to. karooch..you hit it right on the head..the ugliness does draw one//for some reason lots of flkd think being pretty is as pretty does.or somethg like that.i just lov. the jugs. for whom they r.thx. for yr. response. If you don’t do alcohol, celebrate your favourite way…Why not? I have recently decided to sell my Toby mugs and came across your site. Mine is similar to your covent Garden Bill. Mine does have Shorter & Son Staffordshire on the bottom. I can not make out the rest of the writing. I was wondering if you would mind if I sent you a picture in order to get your opinion? I am not sure what to ask for him. Thank you in advance. I enjoyed your website. Hi Shirley. I’m not really able to give you an idea what price your Covent Garden Bill might fetch. I suggest you do some searching on ebay to see what people are paying for this model. I have a toby mug with wood and sons on the bottom.It also has an etching in it also that reads “m/s philpot” I guess it is the artist’s name.Can you tell me the age and what it would be worth.It is probaly worth more to me than anyone else being that my last name is Philpot.Any information would be appreciated. Has anyone ever heard of or came across a Toby Doorstop? I have one which was authenicated by a local antique dealer. Toby is approx. 8″ tall x 4″ wide made of either bronze of brass. In his top hat there is a hole where one could insert a umbrella. Any Idea where I may learn more about this piece and possibly get another? They would be perfect book ends. The Potteries web site has information on Wood and Sons Toby jugs which is hard to find. Also the book Toby Jugs of the 20th Century and their makers covers Woods jugs but in a limited way. I have a Wood & Sons Toby Philpot that I have been trying to get some info on to no avail. There is no formal name like on Royal Dalton pieces but a black stamp ( “TOBY” by Wood & Sons,England and glazed over. Also, there is a #4 indented on the bottom. Thanks for your comments! P.S. Off the internet, I find this…Ralph, the eldest born 1715 achieved renoun about 1750 with his now rare Staffordshire figures, especiallyhis delightful Toby Jugs genuine examples of which are now ‘museum pieces. As e’er drank a bottle or fathom’d a bowl. And among jolly topers he bore off the bell. Well I’m glad to see I’m not the only one with a Toby fascination!! Pals tell me I’m a sad and lost soul collecting them….I’m in my early 50,s and I remind my pals that this ”mid lifer” hobby beats the heck out of buying a Harley,dumping the wife for a bimbo and growin’ a ponytail!! My collection includes a few snufftakers from 1850 as well as an ”across the board” collection of 40 or so Tobys. They are alluring,manly and handsome….each one can tell stories,if they could,of families they watched over from their mantlepiece!!! I a South African so battle a bit to acquire them…not too many here!! Ahh, Andy. That’s what eBay’s for. Your article and the responses were delightful and informative reading. My name is Fillpot, and I am in quest of a Toby Fillpot mug. Can you help me locate one. The name is spelled Fillpot, Philpott, and Philpot. I believe the original Toby Mug was spelled Fillpot, but I am not sure about that. The Philpot pigs have more curl in their tails than the Fillpot pigs. There a are also many more Philpots and Philpotta in the U.S. than Fillpots. My mother has one of these Toby Jugs and is wondering how much it is worth and any additional info on it. She has the Chelsea Pensioner, pictured above to the far left. She thinks it’s about 4 inches tall. Hi Serenity. I am not an appraiser. I suggest the best way to get a check on the market value of a piece is to do a search on ebay sold items for the Shorter Chelsea Pensioner and get a feeling for what people are currently paying for them. karooch is right,check the market value via a site….ebay is the busiest. I have a Chelsea Pensioner by Shorter that I bought athome in S. Africa and paid equivalent of 12 quid…..maybe thats a help to you. Bought a Victorian ”ordinary” Toby for a steal earlier……I enjoy this hobby,just hope the kids want my vast collection when I ”croak”!!!!! Hi, I have two Shorter and sons toby jugs from my mother. One is a man with a fiddle sitting on a pig, and the other is a man standing, wearing a green jacket and yellow vest with a black and white scowling dog. I have searched ebay, but don’t know what their “names” are. Can anyone help? Hi, Sorry – I need to correct my post. One is a Shorter & son: a man with a fiddle sitting on a pig, and the other is Burlington: a man standing, wearing a green jacket and yellow vest with a black and white scowling dog. I have searched ebay, but don’t know what their “names” are. Can anyone help? Mary,200’s a lot of Tobies….I’m on 125 and still scrounging round collectors markets and antique shops,its sort of like fishing…..you never know. Enjoy!